A rare and unusual example of early 1950s American modern lighting design by Greta Von Nessen. 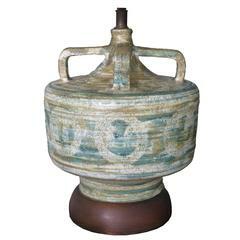 very good vintage condition, shade has original paint, several small dents, minor paint loss appropriate to age. A pair of elegant brass and opaline glass sconces by Mauri Almari for Idman, (model # 71048), signed, circa 1950s. Glass shades have a angled cut-can be turned to the front or back. 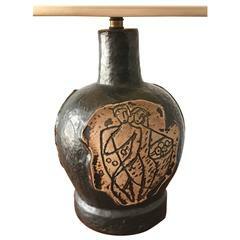 A fantastic, large and impressive Raymor ceramic lamp. 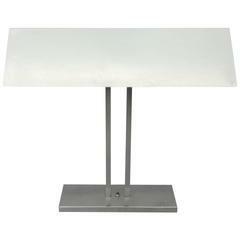 Measures approximately 34.5" H, 18" (ceramic), 14.5" D.
One Greta Von Nessen “Anywhere” table lamp in enameled aluminum and steel. Greta Von Nessen for Nessen New York. 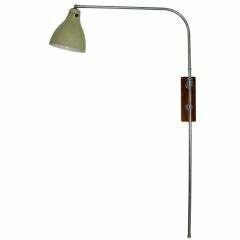 Walter Von Nessen swing arm table lamp with linen shade. 1950s marble table lamp designed by Walter Von Nessen. Original linen shade. All original condition.